I woke up early and rested and set about sorting out the exigencies of travel. Sometime you get caught up in these weird little loops where you want to make a hotel reservation, but you can't make one until you have transport sorted out, but you don't want to buy a ticket off to someplace unless you have a definite place to sleep. So I took a motorcycle from the hotel down to the bus station, bought a ticket, went back to the hotel to call and confirm the reservation to Siem Reap, then grabbed my baggage and returned to the bus station. My moto driver for this last leg (imagine, if you will, the driver, my big backpack between his knees, and me with camera in hand, ducking and weaving through the rush hour streets of Phnom Penh on a tiny little motorcycle) asked the standard questions about where I was from and what I was up to in Cambodia. I told him about the orphanage and hanging out with the kids he was immediately thankful. 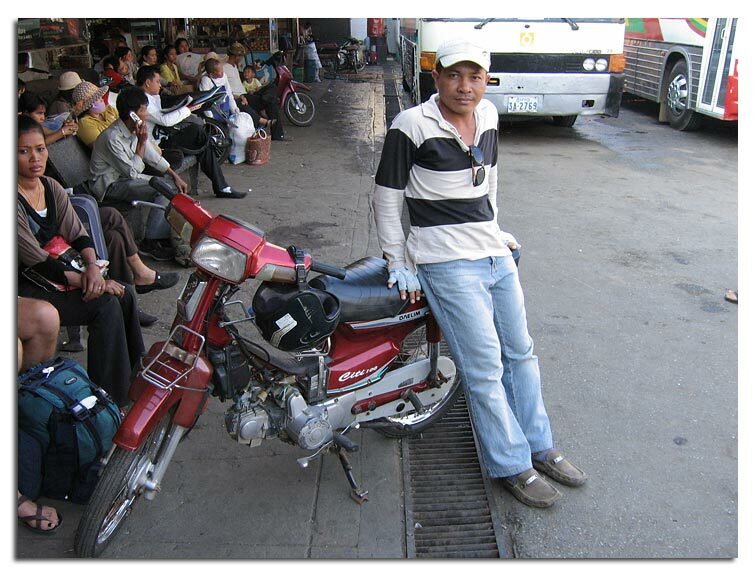 At the bus station he parked the motorcycle so we could go sit down and “discuss a little bit." His name was Ansary. He is pretty passionate in his desire for Cambodia to get to a point where the country can help itself. He has a vision of a Cambodia that effectively enters into the global and regional economy. He is grateful for foreign aid, but at the same time he sees the inherent contradiction of many of the NGOs rolling around town in their new Landcruisers and healthy per diems. He wants to see the money that comes into the country get better leveraged on behalf of the people, and not be so diluted by the series of middle men. He talked about his motorcycle, expressing a sense of gratefulness for it. "I know that if I don't have the moto, maybe I have a bicycle,and this is good too. And if I don't have a bicycle, I have my shoes. That is good too. Because I see people, many people with no legs, or no feet. I must be thankful." He was bright and smart and talked with me not as one would talk to a tourist, but as one would talk with a friend. There is a sense of humor here. Refreshing to see and feel. 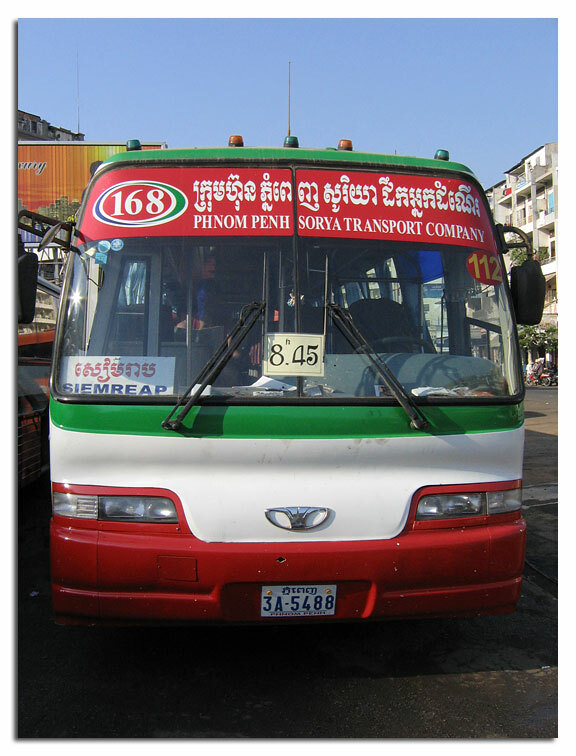 Unlike the Middle East or Latin America, where bus journeys are undertaken with the grim solemnity of a military campaign, the conductor of my bus to Siem Reap addressed the passengers in a lengthy speech in Khmer, then smiling at his own linguistic fumbling, he said, "ladies and gentlemen. 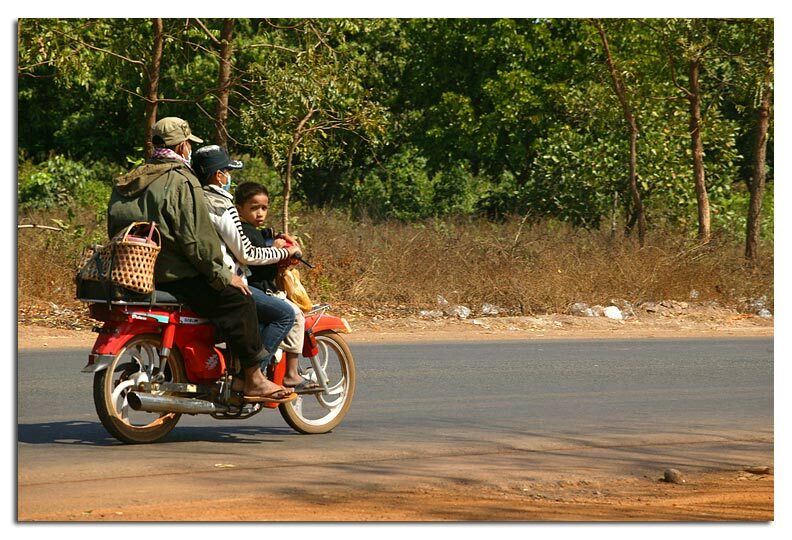 We go now to Siem Reap. On way we stop. Two times perhaps. Is long journey. Good Luck! "And dissolved into laughter. And everyone laughed. 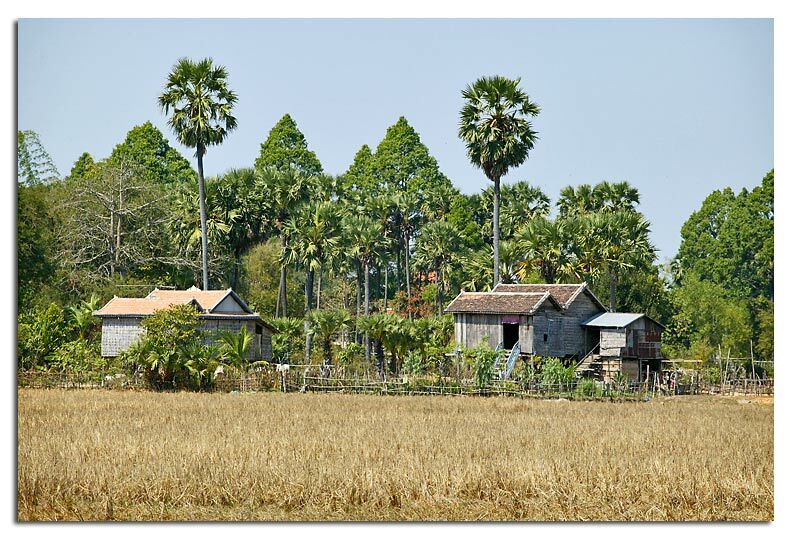 So we motored out of town, first northeast, to get to the other side of the Tonle Sap river, then northwest, across the central part of the country. Flat as a pancake. There are houses on stilts, roadside markets. Lots of agriculture going on. The occasional Wat. Haystacks, banana trees. The horizon is broken up by palm trees, stretching off into the distance at varying intervals. At mid day the light gets hot and white and chalky. We stop at a roadside market and the heat is intense. I buy a pomelo, and the girl smiles and invites me to try one of her enormous stack of cooked spiders. 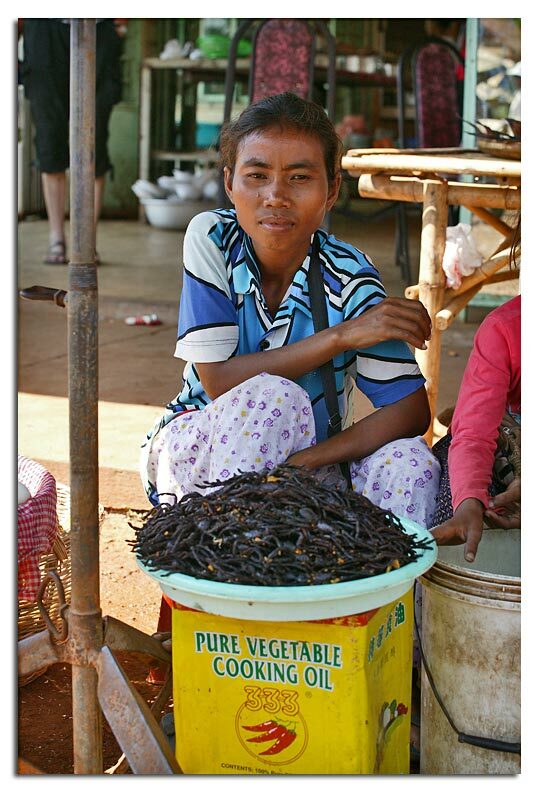 Cambodians are, by necessity, fiercely omnivorous, and a mind boggling array of things pass for foodstuff. 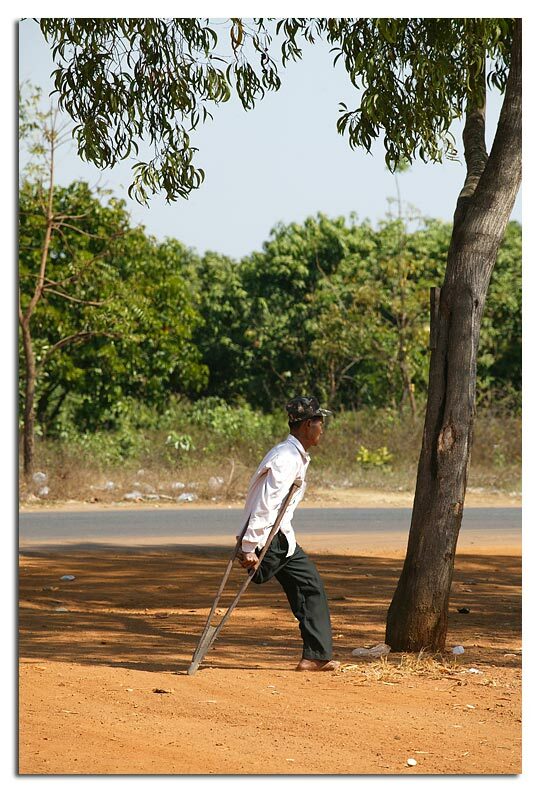 There is ample evidence of the millions of landmines that lay sleeping throughout the Cambodian countryside. The wet dry seasonal cycle adds to the problem by sending torrents of water through the fields and jungles that move or uncover mines and render areas that were previously considered safe dangerous again. The record was six. I couldn't get a pic in time but I saw six people crowded aboard one wheezing little moped.